Knights of Creativity Spirit & Ale: Sir Hook's Traveling Medicine Show: New Orleans, Dublin, London & Rome in 1 Day! Sir Hook's Traveling Medicine Show: New Orleans, Dublin, London & Rome in 1 Day! Yes, in my own personal remake of "The Time Tunnel" and "Around the World in 1 Day", Sir Hook's Traveling Medicine Show took on the world within the universe of Columbus, Ohio. The day began with a promotion...being raised from a lowly Knight to "King David", Lord of the post-ash Thursday Cajun Festival at my client's business in Dublin, OH. Being a transplant from Baton Rouge, LA, my client had everyone don beads and celebrate Mardi Gras one more day. Who was I to say no! Afterwards, it was off to lunch with a radio group to discuss media plans. We were treated to an Italian restaurant in downtown Columbus called Bucca de Bibi. 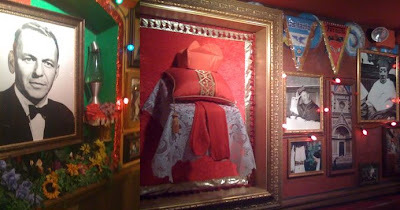 We ate in a room decorated as a shrine to Frank Sinatra and Italian Cardinals. Ah, the Rat Pack, Mafia and Roman Catholics...now I'm really in my element! I had to oblige our readers with a room with a view, that being the bathroom. In keeping with my long standing tradition of sharing bathroom art, I was particularly intrigued by a shadow box by the sink containing old shaving items, cologne, hair tonic, etc...all while enjoying Frank singing, "Oh, Look at Me Know". Back to Dublin for a post meeting drink at one of three "KMSA Sacred Watering Holes", the Dublin Village Tavern. They have posted our Plaque at the bar and mention our organization on their web site home page. Surrounded by 1st, 2nd and 3rd generation Irish, it's a great place to celebrate life with a pint! I was reminded by being transported from Italy to Ireland in just 20 minutes of the classic line of Sean Connery in the movie The Untouchables when he played an Irish Cop being stalked by an Italian Mob Hit Man with a knife...he reaches into a Victrola and swings around with a sawed off shot gun and says, "Just like a Wop to show up at a gun fight with a knife!" I had already shared the bathroom art at DVT in a previous blog; however, some desperate soul the night before had broken the glass frame in an attempt to steal the print of famous Irish urinals. Piss poor job! Last stop was in the new Polaris area of Columbus, again about 20 minutes away. I visited the brand new edition of "the PUB". Based in Cincinnati, OH, this franchise is on a growth spurt with British Pubs. Their positioning statement, in the American era of Irish Pubs, is "Dare to Be Different...Be A Brit!" I couldn't agree more! They have a "Pub Passport", where for $10 you get a passport to get stamped for 55 different British beers to drink. Once completed you get pints for $3 for life. If you visit all 8 locations in Cincy, Columbus, Cleveland, Louisville, Lexington and Fort Lauderdale, FL and get their stamps, then you get $2.50 pints for life. Seeing how I've made the Wall of Foam at Old Chicago twice with 220 beers, I was ready to take on a new challenge. Also, I wanted to bone up on our upcoming pilgrimage to England in July. While at the Pub I did some recruiting. Above are two of the latest Ladies of the Realm, Lady Saralicious of Polaris and Lady Jen of Tonic. Also, not pictured, is the latest Knight, Sir Jeremy of Worthington. Finally, to complete the world tour in a day I had to share the king size Newcastle Brown Ale mirror in the bathroom. Look out England, Sir Hook and his minions are invading soon! The Brits (American decent) are coming! After this world wind tour, I decided to take a break with the angels! how cool of a day is that! Knights Passport? Something to think about! Yes, I was thinking about a Knight's Passport. We could include great international water holes. A goal for future travel, enlightenment and liberal libations!